You may have first diagnosed a patient as psychologically dependent on alcohol (Section 4) or abusing it (Section 5). Or the person may have returned to you directly following detoxification. In the latter case, only the physical dependency has been relieved, and there is still much to do. This map considers early management choices for such a person. 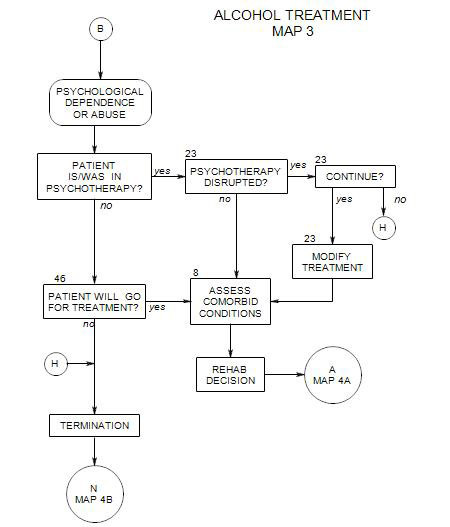 If the patient is currently in therapy or interested in therapy, the next issue is to evaluate his/her other psychological issues (Section 8), then consider rehabilitation (Map 4A). Note that you may also decide to continue the patient without any form of rehab (Map 5A). If the patient is unwilling to consider further treatment, you may have to terminate the patient (Map 4A).